The festivity of brother and sister relationship is round the corner. This year, the beautiful festival of Rakshabandhan is falling on 26th August. It is a great day that talks about the wonderful bond shared by brother and sister. On this day, add more flavours to the sweet and salty relationship shared by siblings. Sisters always look to get many gifts from their brothers. But, don’t make this year boring by gifting chocolates and teddies to your beloved sisters. 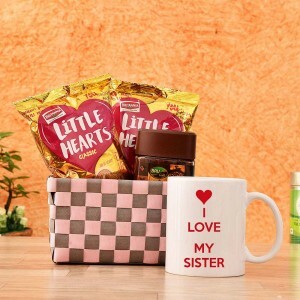 Make it memorable for your sister by gifting her these different gifts. Check them out. Photographs are memories forever. No matter where one stays, these always stay with the person. Gather some wonderful photos of you and your sister. Make a portrait and gift it to your sister. She would love it. Although dinner dates are meant for couples, break the monotonous tradition of dates. Plan a wonderful dinner date with your sister. Well… order all her favourite dishes and make her really special. Girls are totally shopping freak. Nothing can make them happier than shopping. Shopping is a sheer pleasure for girls. So, make your sister really happy by gifting her a shopping card so she can buy things of her choice.